Ok, honestly… beets have been on my “cringe” list for a LONG time. I don’t particularly enjoy the strong earthy flavor, but I usually make myself eat or drink a beet every once in a while because I know it is good for me. 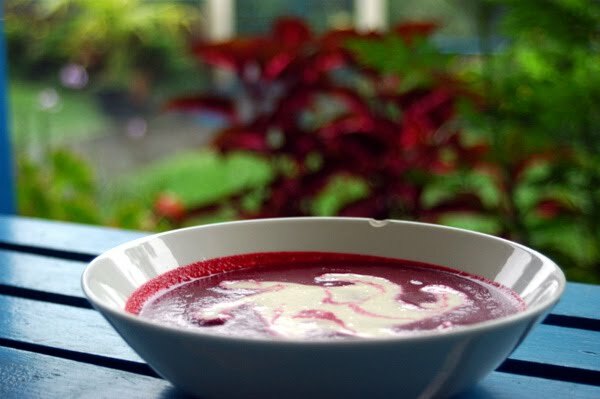 My mom LOVES beets and grew up on them… my Swedish grandma and German grandpa used to make their signature Beet Borscht often and it was a favorite in their family. 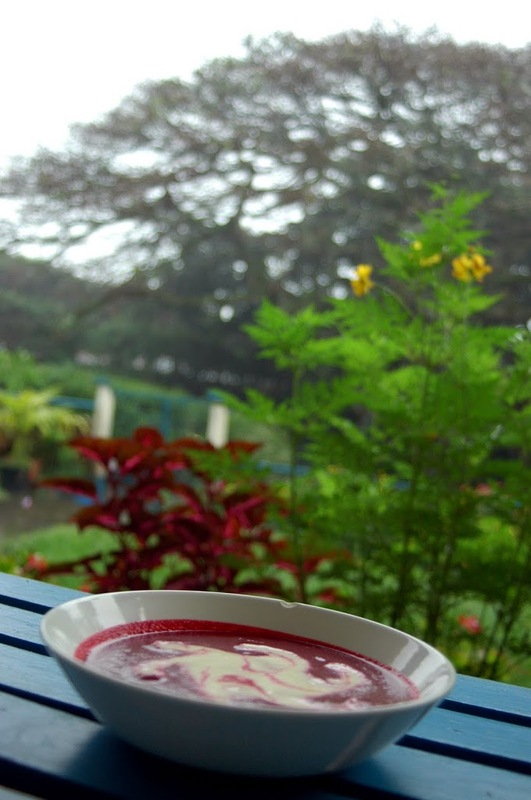 In my Nourishing Traditions book… I kept coming across this simple beet soup, but never really had the desire to make it because you know why. Well, that changed last week because I saw that we had 3 HUGE beets that have been sitting in the veggie drawer for too long and needed to be used. The time for me to have my “once in a while” beet dose was coming up and I decided to make the soup. I knew my mom would slurp it up in a day if nobody wanted it. Did you know that beets are very rich in B vitamin folate, which is vital for normal tissue growth and very important during pregnancy to insure proper development of the baby’s spinal column? Beets are also known to fight cancer, provide protection from heart disease & contains Betaine which helps lessen inflammation. Beets are powerful!! Peel and chop beets. Sauté gently in butter for 30 minutes or until tender. Add water, bring to a boil and skim off foam. Simmer for about 15 minutes. Puree soup with a handheld blender or standing blender (be very careful as it is hot!). Season to taste with sea salt and pepper. Ladle into bowls and serve with cultured cream. Anyway, hope you will try this soup out and enjoy it as much as I did! « Naomi: My Babywearing Girl! I just recently learned about and bought this book so every recipe is an adventure for me. I will have to try this one. I love beets. I’ve actually been craving them lately. I have never made a soup with them though…might have to try that! i’m not a beet person neither. but i love the color that i brings along however you cook with it. just like your soup, classic sharp and beautiful color. Leigh – You will love this book. Don’t let it overwhelm you.. just try one thing at a time. I’ve been using this book for almost 3 years and still haven’t tried everything yet. Divina – I know! That’s the only thing I love about beets.. their bold color. I can’t stand drinking beets alone… gotta mix it with other fruits and orange juice seems to be the best out of everything. LOL! Tasty – Glad you love beets! Wish I did… LOL! Hope you try the soup… its so easy! lululu – Thank you! I love the color too… so bold and rich! This looks absolutely DELICIOUS!!! 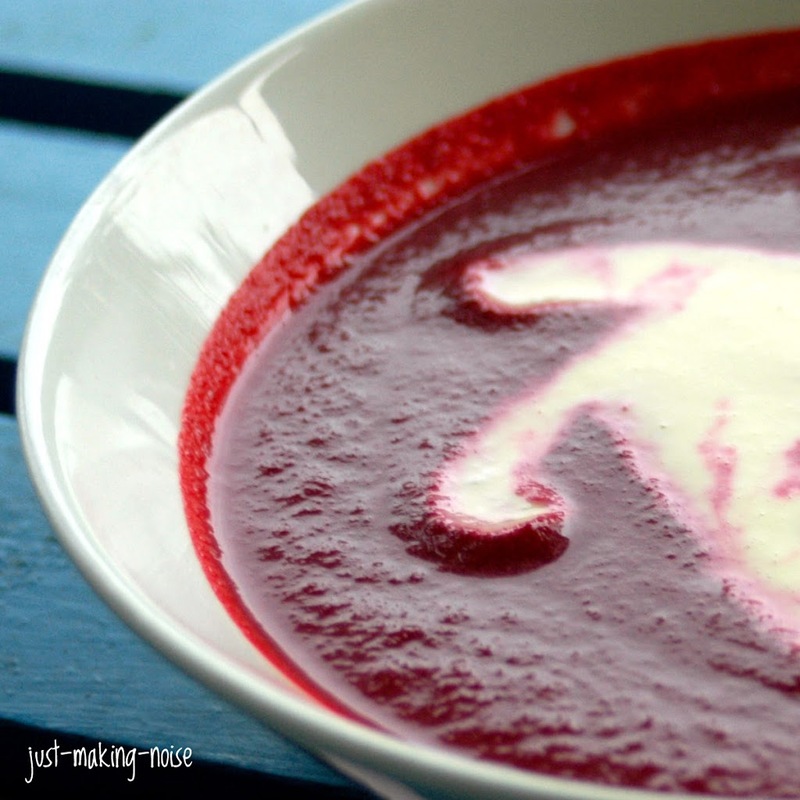 I love beets and beet soup is a favorite! Just found you through Kimi’s blog and can’t wait to try your potato recipe! Also, my sister-in-law-to-be is from Costa Rica! You know it’s funny, I had known beets only to be pickled until about 10 years ago. Great post! Nice way to use beets! I like them a lot, but they’re high in sugar so I don’t eat them that often. This looks good for a small starter to a special meal though. I just got some beets from my Mom and Dads garden and this will be the perfect thing to try them in. Thank you for sharing this looks delicious!